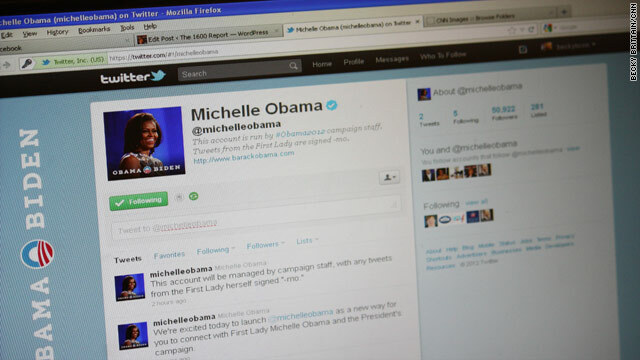 First Lady Michelle Obama has officially joined the millions of people around the world who tweet. Her handle, @MichelleObama, will be managed day-to-day by the Obama 2012 campaign and like her husband's account most of her tweets will be generated by the campaign staff. The tweets she personally sends will be signed with a "-mo" at the end. Her inaugural tweet: "We're excited today to launch @michelleobama as a new way for you to connect with First Lady Michelle Obama and the President's campaign." So far the first lady hasn't officially shared any personal updates but within hours of its creation, the @MichelleObama handle had close to 65,000 followers. Since its creation, President Obama's account has sent out more than 2,500 tweets to its 11 million followers though only a handful of them have been from the president himself. Next entry »Briefing Bites: Why no cameras at Obama HQ? since when does the first lady have a lazy eye? Oh boy, more ways to hear from the "angry black woman." smart? Ok who paid for her education? She came from the south side of chicago and her parents were not big earners...yet her and her brother had Ivy league educations...could it be the taxpayer footed the bill... I wonder how many white kids got this type of treatment? ButI do remember mrs obama was ashamed of America up until her husband got the big job and pay increase! hummmm. So Jerry, you think you paid for Michelle Obama's education? Now that's just sad. @geraldine She was smart enough and worked hard enough to have received a scholarship to Princeton. Remembering that era of history plus knowing a little about the college admissions selection process, and how scholarships are awarded, you can bet she was not only deserving but had impeccable grades. Michelle is angry that people thinks she is angry....She needs another million dollar vacation from the tax payers. Almost anyone would do a better job in the position of President than Obama, probably even diridi. 4 more years of Obama's policies and we'll be Greece the 2nd. Where some are actually giving away their children because they cannot afford to take care of them. Per the global post . com, and the big wobble, among others. Come on people, put down the Obama drink and wake up, look around, see where the same/similar policies have taken western europe. That is our future if Obama is left in office. i guess the path from 2001 to 2008 were the best path forward to the future...you are an idiot. no mrs white...are you an andy single black woman? I was recently at the whitehouse for a budget meeting and barak obama came up to me and introduced himself. The thing I will always remember is that his breath smelled like Joe Biden's nutsack. This will be nice I suppose, if there is one thing that really stands out about Michelle, it is that she has great ideas and great things to say. is this a joke? I think it is funny that anyone would like her. She is ashamed of America, she spends taxpayer money like a meth addict during a bender..and she is always angry. No eyebrows?? The penciling is so obvious. People can live without eyebrows...you seem to be doing fine with no brain. i agree w/ u – on 1 thing – yes the penciling is a good thing – but she doesn't know HOW to pencil it in. Since CNN seems to be playing up the new book on the Obamas and has an interview tonight with the author, some things need to be answered. Usually there are ulterior motives when books such as these are published during an election year. She should be asked her party affiliation, who were her sources (not anonymous ones), when and where she interviewed them and what has been her personal association with the Obamas and the administration. Already some of the juicy lines have been picked up by the rabid right wing bloggers. Everything should be fact checked and the author needs to be accountable for everything she said. She should not mind doing that is it is true, should she? Does everyone remember Nancy Reagan and Kitty Kelley....Kantor just another political journalist trying to make a buck. The "angry Black woman" strikes again! As if we did not have enough of in your face with Mr. O. Anyway, just like her White House vegetable garden, probably one of her 34+ assistants/aides will do the posting/updating for her while she gallivants all over the world. @jerry it seems you are not only racist but ignorant. I think you nailed it Geraldine, with jerry that is pretty much the case...so if the shoe fits you both can wear it. Joan and others, PLEASE grow up! You folks are asking of this author what no one has ever asked when a negative article/book is published about Republicans. Are you trying to hold this author to higher standards because of your obvious political leanings? You should know by know that journalistic objectivity has been death for some time. Still have doubts? Simply read up on some of the articles that CNN reporters/anchor people publish about the Republican Party. Joan, just asking? Also, it may be somewhat of a surprise for you folks to know that I am a life-long Democrat. the obamas have had to craft their imagine very carefully...they don't want the American people to know THEY are racist and they are anti-American. Barack from a mother who admitted she was a Marxist and divorced her Indonesian muslim husband because he would not support her radical political views and a father who well...a real piece of work. Michelle from chicagos south side(black power epicenter) who's father was a democratic operative... Not people who MOST Americans would identify... So now she twitters...ahuh. She is in full damage control! Yes, yes, republicans fighting republicans with many smitings and bitings. How do you lisp in Twitter? why bother. you'll just be tweeting some junior staffer. Those not her's will be followed by a "-less".